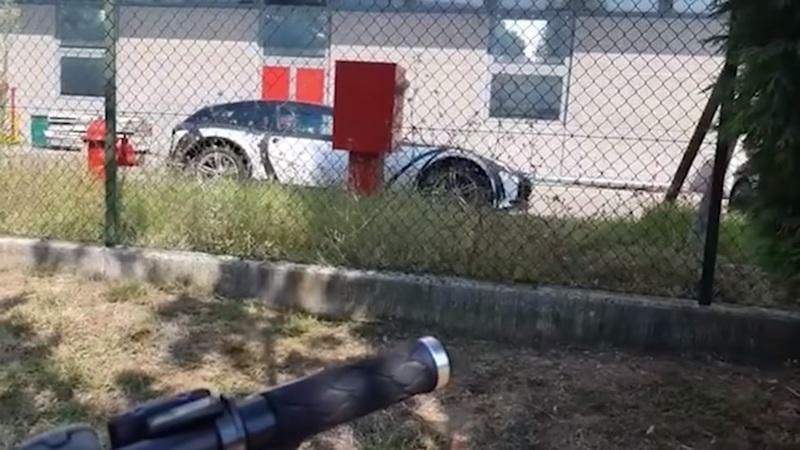 Ferrari is busy developing their first four-door crossover, the Purosangue, and are already testing the hoisted suspension on a camouflaged GTC4Lusso mule. A keen videographer caught the mule for a few seconds from behind a fence so we can get a peek at how high the Purosangue might ride. People have been buzzing for years about a potential Ferrari SUV. There have been coach built four-door models, including the Pinin prototype, but no utilitarian vehicle. Former CEO Sergio Marchionne was strongly against the idea but, now, it seems like at least a crossover sporting the Prancing Horse badge on the hood will become a reality. We already know that it will be called the Purosangue and that it won’t be a proper SUV in the way the Lamborghini Urus and the Bentley Bentayga are, but it won’t be a sedan either. Louis Camilleri, who stepped up to fill the late Marchionne’s shoes, is against having the acronym ’SUV’ spoken in the same breath as ’Ferrari.’ But it will have higher ground clearance than any other Ferrari before it, and it will have the engine up front. It makes sense, then, to see Ferrari testing various suspension setups that might trickle down to the Purosangue on Ferrari’s most laid-back grand tourer, the 2+2 GTC4Lusso which also has the engine in front of the driver. 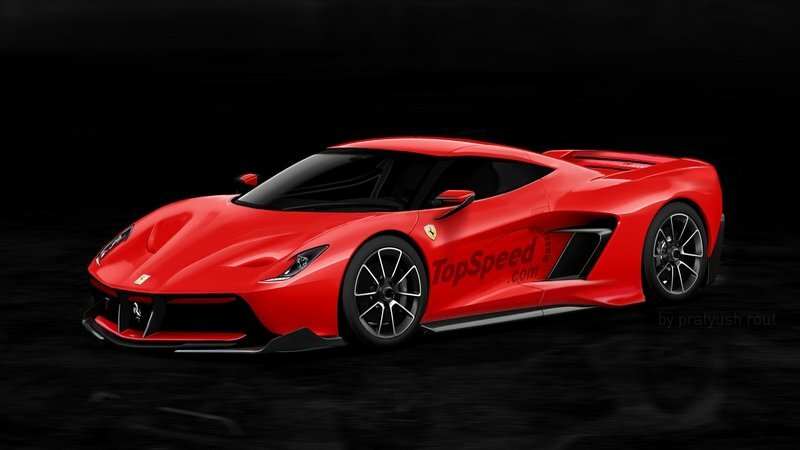 Does This Rendering of the Ferrari Purosangue Make You Feel Happy or Mad? 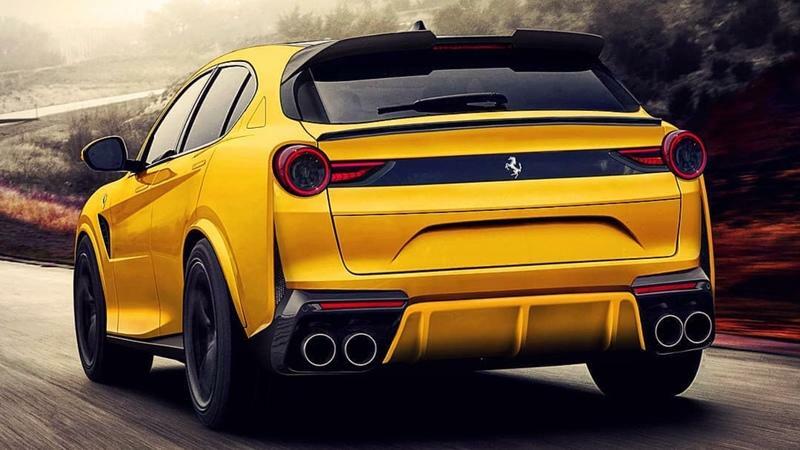 An online artist has released a rendering of the Ferrari Purosangue, or at least a rendering of the SUV’s rear section. The rendering doesn’t reveal the front end of the highly anticipated SUV, but this is one of the first renderings we’ve seen of Ferrari’s future SUV. Speculation surrounding the design of the Purosangue is at an all-time high after the Italian automaker confirmed plans to join the super-luxury SUV market. This rendering is not a sign of things to come, but it does point to what we can expect when the real Purosangue arrives. Ferrari will build an SUV. I am not joking, the company made an announcement. 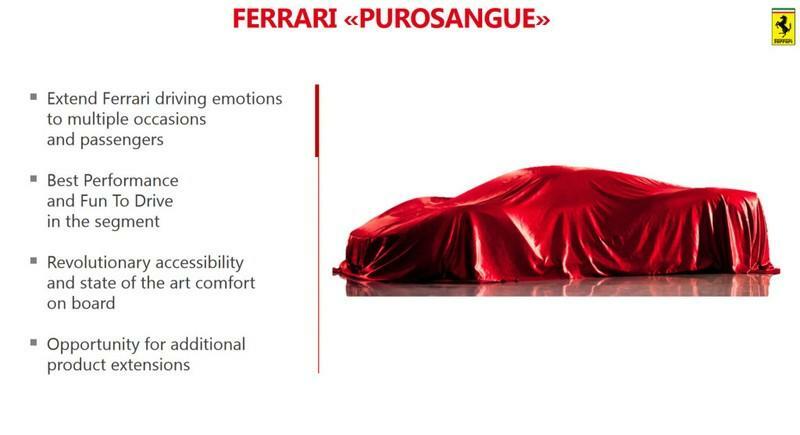 It will be called the Ferrari Purosangue. That’s the official name of the Ferrari SUV. Ok, Ferrari CEO Louis Camilleri implicitly said that he does not want to hear “that word” in the same sentence with the word Ferrari. “That word” being SUV. Ok, Camilleri, I will not do it. Ever. The new Ferrari... truck… will be the most amazing piece of technology ever attempted with the “that word” layout. Luckily, we do know a thing or two about the new Purosangue. Digression: Is the word crossover any better? Maybe, but I feel it sounds too soft for the status of a Ferrari. The Honda CR-V is a crossover for crying out loud. The new Purosangue may take a layout similar to what we have been accustomed to with the onslaught of performance SUVs, yet the Italians promised to make it a proper thoroughbred. Incidentally (not really), Purosangue translated from Italian actually means thoroughbred. Is it just me, or the name Ferrari Thoroughbred (in English) wouldn’t sound bad at all? We have a Superfast and we like it, don’t we? Enough with the strange ideas. Purosangue it is. Ferrari has plans to launch no fewer than 15 new models by 2022, and one of those is said to be the brand’s first high-riding SUV, currently referred to as the Purosangue. It will be a front mid-engined vehicle built on a new chassis architecture with a transaxle gearbox that Ferrari is currently developing alongside a new mid-engined platform. It’s Maranello’s first-ever SUV, ladies and gentlemen! Ferrari’s highly anticipated SUV now has a name. It’s going to be called the Purosangue, and it’s scheduled to arrive sometime in late 2022. That’s the word that came out of the automaker’s future product roadmap. It’s also the first concrete evidence that the Prancing Horse is venturing into the world of SUVs. Specific details are still sketchy at this point, but the Purosangue will sit on a new front-engined platform that can accommodate all-wheel drive and electrification. This news may not appeal to the purists but will surely grab attention. Earlier this year, Ferrari confirmed an SUV is in works and will be arriving in 2019 or 2020. Now it is being reported it will use a hybrid system. Are we ready for a silent SUV from a company known for its engine notes? Read on for more details. 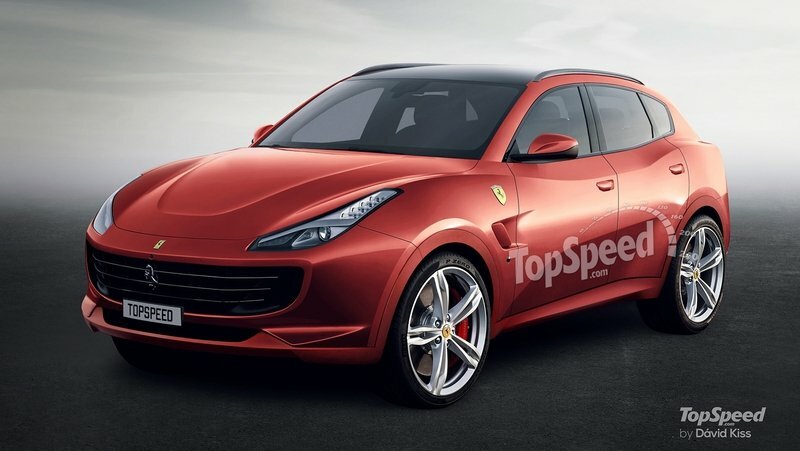 Ferrari to Deliver Hybrid V-8 in 2019 - Will it be Used to Fight the Lamborghini Urus SUV? There’s no turning back for Ferrari now. The Italian automaker is now fully invested in the world of hybrid powertrains as company CEO Sergio Marchionne confirmed that a Ferrari V-8 hybrid is coming in 2019. Marchionne didn’t elaborate on the details just yet, but he did admit that test mules of the car are “around now.” If the hybrid powertrain finds its way into a production model as many expect it would, it would become the first series-production hybrid model Maranello has on the road since the Ferrari LaFerrari. Ferrari is looking pretty good at the moment, posting solid numbers across the board. However, the brand hopes to pull down substantially higher earnings in the next four years, and will look to previously taboo segments to do so. The tea leaves have spoken, and we can now read it, clear as day. Ferrari is building an SUV. We got confirmation — yet again — from FCA boss Sergio Marchionne, only this time, Marchionne confirmed that the SUV is arriving by 2019 and that it’s going to be the fastest of its kind in the world. Did you read that, Lamborghini? The Prancing Horse has its eyes set on the Urus, and it’s galloping to take the proverbial bull’s mantle. The talk within Ferrari now moves on to the next phase of the SUV project: production. Marching didn’t elaborate on the specifics of the SUV, or as he calls it, the “FUV.” Instead, we learned that the Italian automaker will spend the next 30 months - two-and-a-half years - discussing the production volume of the model. Seeing as this is Ferrari, don’t expect the final number to be high since the company wants to preserve its status of exclusivity. Tacking a production volume in the high four or five digits would run counter to that position so at best, we can expect somewhere in the neighborhood of 2,000 units, give or take. For now, Ferrari’s concern is how it plans to strike a balance between exclusivity and scarcity, something it plans to address when it rolls out its new five-year plan in the first quarter of 2018. That plan should reveal more information about the Ferrari SUV and all other models that will create the company’s lineup in the next decade. Rumors of Ferrari planning to build an SUV have been flying around for more than a decade now, and the general consensus is that a utility Prancing Horse is no longer a matter of "if," but "when." And that time is getting closer, with new reports from people familiar with the company’s plans claiming that the Ferrari SUV will get the green light by the end of 2018. Specifically, Sergio Marchionne wants to devise a new five-year plan for the brand until he retires in 2021 and the new strategy will include a four-seat "utility vehicle." According to Bloomberg, Ferrari finally wants to move beyond its traditional supercar niche in an effort to double profits by 2022. Sounds like the kind of strategy we’ve seen from most automakers, including Maserati and Alfa Romeo, lately, right? Yes, but for Ferrari, things are a bit more complex. Adding an SUV means that the self-imposed limit of 10,000 vehicles produced per year will be exceeded and push Ferrari beyond its small vehicle maker status that protects it from some of the more severe fuel and emission rules. In return, Maranello will have to roll out more hybrids in order to keep its carbon footprint down. Gasp! Is Ferrari Finally Getting On Board The SUV Bandwagon? Don’t look now, but it appears that hell is indeed freezing over. One of the last automakers to resist the allure of SUVs is reportedly on the brink of jumping in, and wouldn’t you know it, that automaker is Ferrari. The suggestion itself is enough to make automotive talking heads explode, but a recent report from Car Magazine is suggesting that Ferrari is actually well past the point of "considering" an SUV; it’s already in the active project phase and it even has its own codename: F16X. The full scope of details surrounding the rumored Ferrari SUV haven’t yet been announced, but the same report from Car Magazine is saying the model will take the shape of a high-riding, five-door coupe and will be developed together with the successor of the Ferrari GTC4, which itself is scheduled to be replaced in 2020. Among the bits of sourced information revealed by the report include the likelihood that the model will use an aluminum architecture and will also feature suicide doors and an all-wheel drive system. It’s also thought of that the F16X will also make use of either a V-8 engine or a hybrid powertrain. Should it end up with the latter, it would become the first hybrid car in Maranello’s history that’s not named LaFerrari. The timetable for the model’s release is still unclear, although there’s a strong possibility that we won’t see it arrive either in concept or production form anytime soon. If it does come to pass and Ferrari green-lights a production version, look for the SUV to attract a price in the vicinity of €300,000, or just a little under $350,000.